Australians have many sporting heroes, but our greatest and best known comes from the sport of cricket (see Podcast 40). That person is Sir Donald Bradman. Sir Donald, or ‘The Don’ as he was known, is, without doubt, the best cricketer which Australia has ever produced. Indeed, he is arguably the best cricketer ever, from any country. He played test cricket from 1928 to 1948. He was just so much better than anyone else of his time. His test batting average score was 99.94 runs per innings. This is an amazing average. The very best test batsmen of the last 100 years have a test batting average score of around 50 to 60 runs per innings. This includes such great batsmen as South Africa’s Graeme Pollock (60.97), England’s Ken Barrington (58.67), the West Indies’ Gary Sobers (57.78) and India’s Satchin Tendulkar (53.78). These were all fantastic players, but the Don, with an average of 99.94, stands head and shoulders above them all. He was simply the best test cricket batsman ever. Don Bradman started playing test cricket at the age of 20, when Australia, and indeed the rest of the world, was struggling to overcome the great depression which lasted from 1929 to the late 1930s. Many people were out of work and many people were finding their day to day life very tough and very difficult. I wasn’t yet born at that time but I can imagine that Don Bradman’s wonderful performances when playing for Australia would have made every Australian smile and forget their troubles for a while. He became a hero to all Australians. 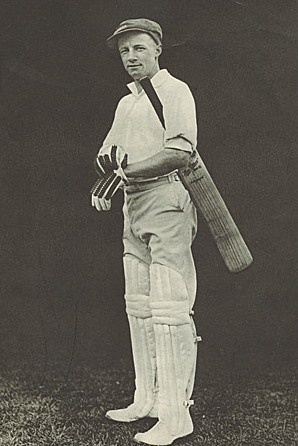 In just his second five test series playing against England in 1930, at the young age of just 20 years, the Don scored 974 runs with an average score of 139. This included one century, two double centuries and his best ever test cricket score, a triple century of 334. This innings, in July 1930 at Headingly Stadium in Leeds, England, was amazing because he scored 309 of those runs in just one day. No other test cricket batsman has been able to achieve more than 300 runs in one day. The Don was truly a run making machine. In his test career, he played 52 tests and made 29 centuries. Remarkably, he scored 26% of all the runs made by the Australian Cricket team in those 52 tests. That is remarkable when you think that every cricket team has 11 batsmen. He was a very difficult batsman to get out and he knew how to score runs quickly. Sir Donald went on to become Australia’s Test Cricket captain, finishing with a record of 11 wins, 3 losses and 5 draws and as captain he never lost a test series. The Don’s batting was so extraordinary that the English cricket team tried a special type of bowling in the 1932/33 Ashes series in Australia. This was called bodyline and involved bowling the ball at the batsman, rather than at the wickets. Not even this was entirely successful, and Bradman still scored a century and scored an average of 56 runs per innings in that Ashes series. The use of bodyline bowling was very controversial, causing a dispute between the cricket administrators of England and Australia, which in turn almost caused bad relations between the governments of Great Britain and Australia. The laws of cricket were later changed so that bodyline bowling could not be used again. Sir Donald’s last test innings was in the fifth Ashes test against England at the Oval, in London, England, in 1948. As captain, he had lead the team in that series to a 4 matches to nil win, scoring another 2 test centuries himself. In his very last innings as a test cricketer he walked to the wicket to a standing ovation from the English crowd. This must have been a wonderful moment for the Don at 40 years of age. When he reached the wicket, the English team lifted their hats and gave him three cheers. When play finally started, the Don needed just 4 runs to achieve a test batting average of 100 runs. Incredibly, the great man was out, bowled, with just the second ball he faced, for 0. The radio commentator, John Arlott, was stunned and almost unable to speak. As the Don walked off the ground to still more loud applause from the crowd, the commentator suggested that perhaps the emotion of the moment must have affected him. Whatever the truth, this last innings brought to an end the greatest cricket career in history. Sir Donald went on to became an administrator for Australian cricket, working for the Australian Cricket Board until 1980. In 2000 he was voted the greatest cricketer of the 20th century by the Wisden Cricket Almanack, the world famous cricket reference book. There were 100 judges who were asked to nominate their five best cricketers, and every one of the 100 judges selected Don Bradman. Sir Donald died at the age of 92, in February 2001. His funeral service was watched by 1.45 million people on television. The Don’s career was so remarkable that songs have been recorded about him, many books written about his life and career and even a film made about the bodyline controversy in 1932. He became the first living Australian to have his picture put on a postage stamp. I never saw him play cricket, yet I know that he is an Australian sporting hero who was, and continues to be, an inspiration for all sports men and women in Australia. Podcast 48 Quiz - Did you understand the podcast? True of False? – Don Bradman’s test cricket batting average was much better than any other cricketer’s batting average. True or False? – Don Bradman played his test cricket before the Great Depression. True or False? – Don Bradman’s batting performances made people forget their troubles for a while. True or False? – Don Bradman’s second test series was not very successful. True or False? – Don Bradman scored 26% more runs than the other players in the Australian Test Team. True or False? – Don Bradman became captain of the Australian Cricket Team and only lost 3 test series. True of False? – Don Bradman’s batting was so good that the English cricket team tried to use bodyline bowling to stop him making high scores. True of False? – In his last test match, the Don received a standing ovation from the English cricket team. True of False? – In his last test innings, Don Bradman scored 4 runs. True or False? – Don Bradman is an inspiration to all Australian sports men and women. average score = the middle score of all the scores. To calculate an average, add all the scores and then divide the total by how many scores you have. Recently Spaniards have suffered the lost of one of our sport legends: Ángel Nieto, 12+1 (as he liked to say as he was very superstitious) World Champion in the 60s, 70s and 80s). I´ve heard about his beginnings as a pilot, living in Barcelona, in a basement, in a very humble way. Sadly, he died last month, driving a quad without helmet. Thank you for your approach to an unknown sport for Spaniards as cricket. Many thanks for your comment. Our sports heroes are always special to us and it is sad when their life after sport is not so successful. Unfortunately there are other examples like yours in Australia as well. Nowadays, current professional sports people also focus on life after their sports careers are over. That is a good thing. Terrific post Rob. Your narrative of the great mans life and career adds rare insight and perspective to his achievements. Hi Ray. Many thanks for your feedback. The Don was certainly an extraordinary Australian.